Those are pencils, Mike, but I've done quite a lot of charcoal. And Meek, I kinda like the idea of O.P. Heggie as Father Christmas. I'm glad you enjoyed the Sketchy Things books. The website is http://www.sketchythings.com. There are pages for caricature, oils and charcoals. Take a look when you get a chance. Greetings Frank! So happy to see you here at the UMA. I'm a huge fan of your art. Love the whimsical style you bring to the monsters! It's been an equal pleasure in speaking with you at the cons too. Please do feel free to share as much as you'd like here Frank. I know I'm all eyes! Here's a wonderful pencil drawing that was gifted to me by UMA member "Mombie". 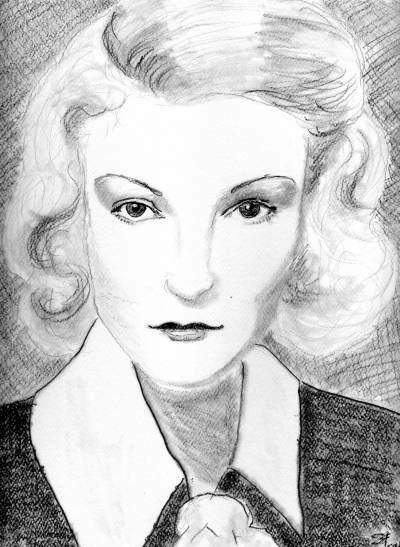 Sheila knew of my long time infatuation with Helen Chandler and picked up a #2 pencil to capture her incredible beauty. Here's my latest commission, done for our own Keith LuBrant. This one was a lot of fun!! Welcome Frank! So glad to see you here! 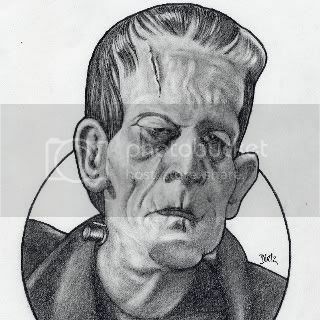 Wow, Mike - I may be particular to this character but I do believe he is your best classic monster piece so far. Say you have prints available of him? Wow that London After Midnight is amazing! Great job!! Wow, all of this beautiful artwork is making me want to draw some monster art too. Fabulous work guys, keep it up! Jeff, thanks for your comments, but no, due to the fair use law I am permitted to produce one work of art based on a painting, but not to produce prints from that same piece. My friend Frank! Were your ears burning? You've been talked about here! Welcome, warm welcome. Mike, that London after 12:00 am is simply amazing! You never cease to amaze me with your talent. Man, I wish I could paint like that. Unfortunately, my painting skills (or lack thereof) are better left to painting houses. Terry, thanks very much for the kind words. Much appreciated. See, you're one up on me: I can't paint houses worth a darn! Pardon my tardiness Mike, but this painting is top drawer---your color choice implies menace and do I like a healthy dose of menace in a painting. So once again, my college art instructor's theory about paintings not causing the viewer any feelings has been shot squarely in the arse. Meek, I always appreciate a fellow artisan chiming on on my work. I just visited my friend Keith this past weekend and was able to see the other paintings that he got from you Mike. He mentioned that this was to be the next painting from you. Firstly, can I just say that seeing your work in person is even more amazing. he's going to be blown away by this latest one. It is really FM cover-worthy. I'm jealous.